All transactions are safe and secure with a reliable history in online purchasing behind each of our associates. 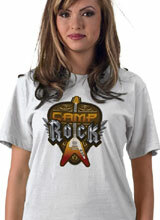 Buy the Camp Rock Guitar Pick Logo t-shirt to own Camp Rock clothing and merchandise. The unique Camp Rock clothing item on the left displays a guitar pick logo design that emphasizes the rock and roll elements from the original Disney Channel movie. An electric guitar stands vertical in the design and metallic font highlights the word "Rock" in the film's title. These guitar pick Camp Rock tees are perfect for older fans, or even young fans who want to have a jam session with their friends. You can practice singing Connect Three's "Play My Music" Camp Rock Soundtrack song. If music is in your soul, never let it go. Embrace the music with Shane and Mitchie Camp Rock dolls. In addition to the Camp Rock Guitar Pick Logo tee above, browse the Camp Rock Clothing Gallery for more apparel like men's and women's clothes, kids shirts or hoodies.